One of the most remarkably inventive voices of his generation, author Will Self delivers a new and stunning work of fiction. 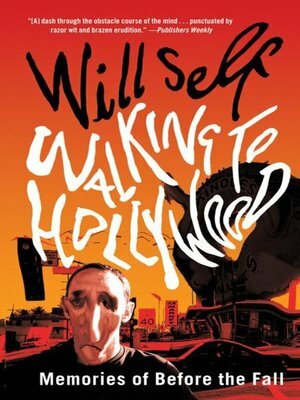 In Walking to Hollywood, a British writer named Will Self goes on a quest through L.A. freeways and eroding English cliffs, skewering celebrity as he attempts to solve a crime: who killed the movies. When Will reconnects with his childhood friend, the world suddenly seems disproportionate. Sherman Oaks, scarcely three feet tall at forty-five, and his ironically sized sculpturesreplicas of his body varying from the gargantuan to the minisculespark in Will a flurry of obsessive-compulsive thoughts and a nagging desire to experience the world by foot. Ignoring his therapist and nemesis Zack Busner, Self travels to Hollywood on a mission to discover whoor whatkilled the movies. Convinced that everyone from his agent, friends, and bums on the street are portrayed by famous actors, Self goes undercover into the dangerous world of celebrity culture. He circumambulates the metropolitan area in hallucinating and wild episodes, eventually arriving on the English cliffs of East Yorkshire where he comes face to face with one of Jonathan Swift’s immortal Struldbruggs. A satirical novel of otherworldly proportion and literary brilliance, Walking to Hollywood is a fantastical and unforgettable trip through the unreality of our culture.